THE PENTAGON – The Navy’s undersea warfare division is eyeing a stable two-a-year attack submarine rate to reach its ultimate goal of a 66-SSN fleet, despite calls from outside the service to build a larger navy faster. 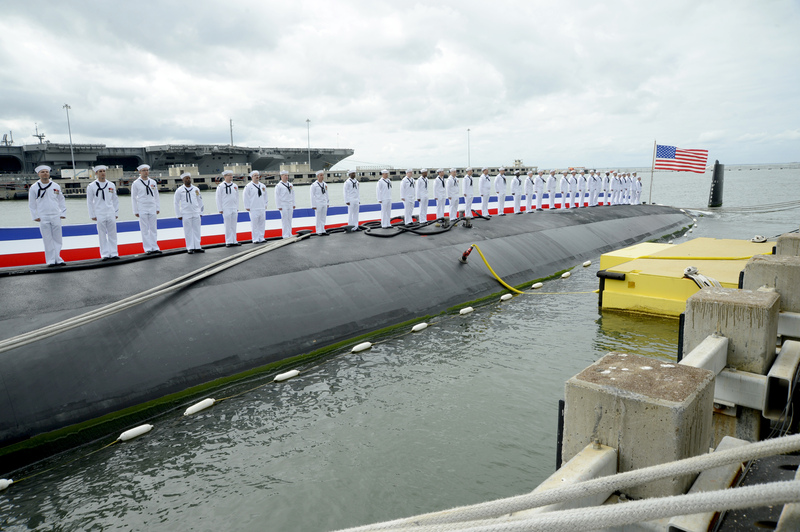 Acting director of undersea warfare (OPNAV N97) Brian Howes told USNI News today that the service plans to build two Virginia-class submarines a year, which would allow them to reach a 66-boat force by 2048. Building two a year even in years when the Navy buys Columbia-class ballistic-missile submarines would be an increase compared to previous plans, which had just one Virginia sub in years when the Navy also bought an SSBN. The increase in the attack boat requirement, which had previously been set at 48 SSNs, comes as part of the Navy’s push to build a 355-ship fleet. Various stakeholders have described vastly different timelines for reaching 355 ships in the 11 months since the Navy released its updated force structure assessment. Though the House Armed Services Committee said it believed the buildup would take 25 to 30 years, and Tom Dee performing the duties of under secretary of the Navy said it could take 30 years or more, others have suggested more aggressive timelines– the Congressional Budget Office suggested a potential 15-year timeline for reaching 66 attack submarines, Naval Sea Systems Command suggested a plan that shaves 10 to 15 years off in part by extending the life of current surface ships in the fleet, and lawmakers are pushing for higher SSN procurement rates. The Fiscal Year 2018 National Defense Authorization Act allows the Navy to buy 13 over five years, or three a year in non-SSBN years. Still, Howes said the OPNAV staff and N97 specifically are committed to two a year. “All of the divisions in N9 are working on how to establish the right industrial base sustaining rate to build to the levels we need. We talked about at the Sub League Symposium that that’s two per year for us, SSNs. If you stay on two per year you end up at the force objective, which is 66. It’s in the out-years, but it’s stability, and it allows us to maintain the industrial base and not have peaks and valleys in the profile,” Howes said in an interview today. “Now as we are building up slowly, as we get above 48, we also have to make sure that we have the total ownership cost in our budget to sustain those additional ships,” he continued. Howes made clear “we’re not saying no” to building more than two attack submarines per year, but for now the emphasis is on a predictable and stable build rate for industry. “If we say we’re going to do three a year, we need to give [industry] a signal to do it, and then have them build out their facilities” for a higher build-rate, he said, but an increase to three a year would be dependent on proven industrial base capacity and additional resources – which would likely involve a repeal of the Budget Control Act and its strict spending limits, he said, so the Navy would have a topline to support not only buying more subs but also buying more ships, aircraft, people, and other things needed for a balanced larger force. Howes comments are the second this month on the Navy’s commitment to building two attack subs a year and no more. Vice Adm. David Johnson, the military deputy to the Navy’s acquisition chief, said earlier this month that industry needed to prove it could reliably maintain a 60-month build cycle during two-a-year acquisition before the Navy would consider buying three a year. Those comments were made from a program and industrial base health standpoint, whereas Howes’ comments speak to the Navy’s requirements and funding intentions. Since that time, though, Navy officials have publicly spoken about the importance of getting the stable two-a-year production right before starting talks about adding a third boat in any given year.